Media captionWhat is "safe standing" and how does it work? Liverpool fans who visited Celtic's stadium to witness safe standing in action found the experience "overwhelmingly positive". The Spirit of Shankly supporters group organised Saturday's trip to help learn more about how rail seating works. The club has previously described the issue as "uniquely complex" because of the 1989 Hillsborough disaster. Spirit of Shankly chairman James McKenna said fans were given "a really, really good insight". 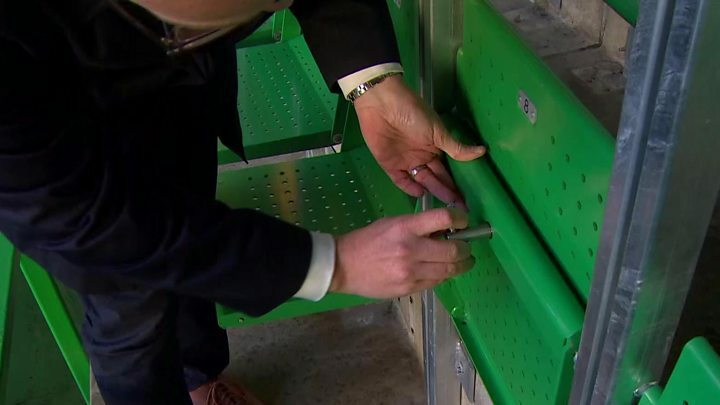 Mr McKenna described the atmosphere in Celtic's Scottish Premiership match against Ross County as "remarkable" and was "pleased" to hear police and stewards say they found safe standing easier to police. He added: "It did feel safe. It just felt normal. You had a bit more space, and there was no sense that it felt cramped or overcrowded. At many football clubs in Europe, safe standing involves rail seating, which allows seats to be moved between a seated or upright position, with a waist-high rail providing additional safety in front of them. However, there are no immediate plans to lobby for the system to be introduced at Anfield, despite Liverpool fans voting in favour of rail seating in an online poll. Spirit of Shankly said the group would "consider what the next steps might be" following the visit, which included some Hillsborough survivors. Mr McKenna said the group would share video footage and wanted the experience "to settle in people's minds". In a previous statement, the group acknowledged the visit would be "a difficult experience for some", and it was "not an endorsement, nor a pre-cursor to calling for it at Anfield". The requirement for all-seater stadiums in England's top flight was a response to the Hillsborough disaster, in which 96 people died.